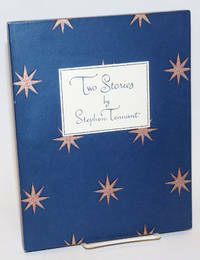 New York: printed at Spiral Press for Pantheon Books, 1955. Hardcover. 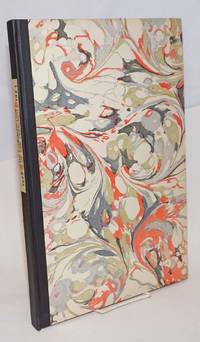 The true first of this compilation, with Calder's : 75p., line-drawn animals and human nudes by Calder, Wilbur's choice of "extracts" (Melville on whales, &c) designed and printed at the Spiral Press by Joseph Blumenthal, limited to seven hundred and fifty copies numbered 51 to 800 on a specially made "Curtis Rag" paper numbered and signed in sepia ink by both Calder (his, sweepingly large) and Wilbur (italic-influenced sobriety), this being #727, very good in 9.25x12.5-inch blue-black cloth boards and silver titles on spine with silver Calder design on cover. A clean sound near-fine copy. Berkeley: Tamalpais Press, 1962. [3p], rubricated colophon, plus the single original leaf from 1503 that has two woodcuts and two drop-cap initials; 9.25x13.5 inches. Prefatory material runs all three pages with source-list. 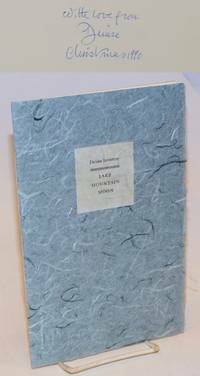 Lovely monograph booklet, #58/135 copies printed and bound by Roger Levenson in sewn green paper covers; faintly edgeworn with a hint of sunning and a tiny droplet-stain at top edge, a very good copy. The two cuts are charming, and the two initials in reasonably good shape: Olmsted comments that Zanni's initials were "of small size but of real merit," and that "most of them show rather hard use" One of 100 copies reserved for members of the Roxburghe Club of San Francisco. Vancouver: Standard Editions, William Hoffer & the Pulp Press, 1979. 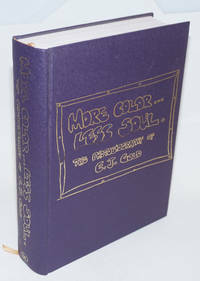 16p., 7.75x11 inches, frontispiece illustration,one of 60 copies signed by author and illustrator out of an edition of 386 copies, fine first separate printing booklet in sewn gray wraps. The first separate edition of "Lost", originally published in 1956 i "The London Aphrodite" under the pseudonym Patrick Shone. 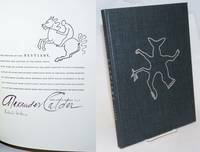 Printed in an edition of 386 copies of which 26, lettered A to Z are signed by the author and editor and specially bound, 60, numbered 27-86 are signed by author & illustrator (this is #65) and 300 numbered 87-386. San Francisco: The Arion Press, 2002. Pamphlet. Unpaginated booklet-type item, softbound in 6.5x4.7 inch decorated stapled wraps; a fine clean copy. [63rd Arion Press production]. 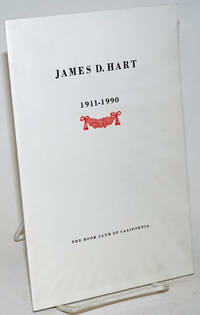 San Francisco: printed by The Arion Press for The Book Club of California, 1990. Single quarto leaf folded twice to wrap the 1p. text, making a 6x9 inch classical brochure with rubricated cover device and initial. Very nice work on very nice paper (not specified); one of a run of 1,000. San Francisco: The Book Club of California, 1976. Hardcover. 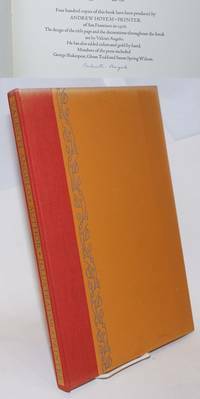 97p., rubrication and colorwork throughout, folio-size hardbound in 14.5x10-inch boards with an openweave red cloth spine and printed paper label. One flaw: top margin is severely sunned, leaving an eighth- to a quarter-inch top margin of dessicated fabric and bleached-out color (no strictly structural damage). An otherwise great copy, no ownership or any other markings, a very pretty book (except for that sun-line). Presswork by Andrew Hoyem and his crew; colophon notes that Mr. Angelo "has added colors and gold by hand" where his palette outstrips Hoyem/Bk Club capacities. San Francisco: The Book Club of California, 1961. Pamphlet. Twelve folio leaves printed and folded once to make 10x8 inch rubricated quarto brochures, each featuring a period photo, image or exhibit. 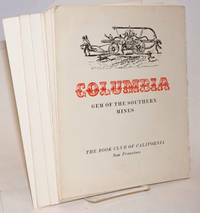 The face of first item in series "Columbia" is noticibly (but evenly) toned and the rest of the covers are not; slight edgewear; good to very good set. We believe that the series wound up with the offer of a slipcase for this and other sets of "Keepsakes," here lacking. The Book Club of California keepsake series. One old firehouse, at 16th St & Albion in San Francisco, is a longtime punk bar, The Kilowatt. Its rooftop forepole housing has been left alone, still picturesque and well-preserved but don't order a martini. In the mid 60s a Waller St firehouse showed silent movies ("Storm Over Asia" and "Broken Blossoms" with the Gish sisters were memorable). In the 70s it was an antiques dealership. San Francisco: designed and printed by Lawton & Alfred Kennedy for John Howell - Books, 1970. Hardcover. xvii, 77p., 10.5x14 inches, color frontis, rubricated title page, preface, glossary, references, index, illustrated with13 color plates and two large folding maps, very good first edition thus limited to 5000 copies bound in white cloth boards and gilt, and a white dj printed in black and red (this dj is somewhat soiled and has short tears at the heel). Browerville, MN: Ox Head Press, 1990. 15 unnumbered pages, miniature book bound with thread, one of 300 copies in paper cover. Approximately 2.5x3 inches. Volume 3 of Minnesota miniatures. 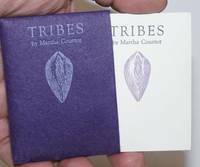 First published in 1977 as the last chapter in the lesbian activist poet's book, Tribe. 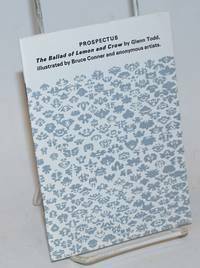 [Norwich, VT]: Elysium Press, 1993. Hardcover. [42p] foreword, illustrations, fine limited first edition thus, printed by hand at Graphic Arts Workshop at Dartmouth College and limited to 150 numbered copies set in Spiral type and printed on Arches paper, this is copy number 119, bound in black Japanese silk boards and with a paper title label on spine. Leyburn, North Yorkshire: Tartarus Press, 2008. Hardcover. 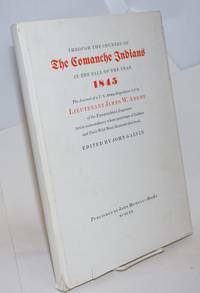 xii, 293p., frontis photoportrait of the author, a large pretty book hardbound in 9.5x6 inch red-papered boards gilt and elegant dust jacket. A place-keep ribbon is bound in. A limited production, one of only 300 copies, the unclipped dj tells us it was a pricey item when new (thirty pounds), and obviously remains so; this is in very good, clean, unmarked condition, the top rim of dj and casing is just slightly crimped, else-fine condition (and a reasonably successful attempt to issue a fine-press-type item without actual handset letterpress efforts). 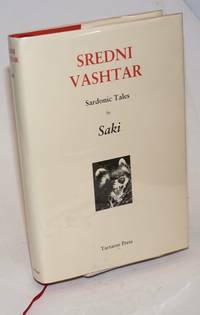 Nevada City CA: Heidelberg Editions International, 1993. Hardcover. l [i.e., fifty in Roman numerals], 643p., true first edition (the "deluxe"), hardbound in 11x8.5 inch textured purple cloth boards (2 1/2 inches thick), profuse b&w scrapbooking of publicity stills, snapshots, posters, exhibit and journalistic photography. Faux finepress (or merely klunky): the fonts are jarring, the marbling is real but looks phoney, but-- hey, a fine clean unmolested copy, one of 125 total, the copy in hand features a seriograph entitled "Waiting II" (signed inconspicuously in pencil). Take it away! North Pomfret, VT: Elysium Press, 1995. Hardcover. iii, 56p., frontis-portrait by Cecil Beaton tipped-in, introduction by Hoare, two stories illustrated with color plates and drawings by the author, fine first edition limited to 200 copies (this unnumbered) printed by hand, Cochin typeface on Zerkall paper bound in pink quarter-silk and blue English wallpaper boards with star design encased in a two-part matching box withpaper title label affixed to the lid and a color plate reproduction of one of Tennants artworks with a description of the book printed on recto. These previously unpublished works are comparable in style to Firbank. Tennant was a lover of Siegfried Sassoon. Llandogo, Monmouthshire: Nicolas McDowall at Old Stile Press, 1997. Leather Bound. [28p] 10x13 inches, two-color linocuts printed direct from the blocks, Blado typeface on Hahnemuhle Ingres paper, binding designed at The Old Stile Press, limited to 225 copies and ten of this special binding designed by Paul Delrue in dyed goat skin, #VIII/X copies signed by the binder and the artist, housed in a two part printed linen slipcase also designed by Delrue. "The Hon. Roden Noel lived from 1834-1894. He was the son of the first Earl of Gainsborough and, at various times, traveled alone in the East and climbed the Alps - as well as living and writing in England." from the colophon. 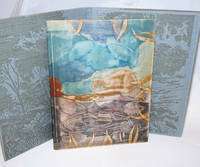 This copy is a specially-bound copy one of ten with wraparound illustration on goatskin, lovely design. Only 19 of the regular limited edition found in OCLC and none of the special edition as of 10/2018. Uranian content. no city / London: The Classics of Obstetrics & Gynecology Library / D. Wilson and T. Durham, 1764. Modern facsimile in pressed leather boards, gilt-titled and decorated in period style; caveat emptor, may be "reconstituted" leather. All edges gilt (overbright) with faux marbled endpapers; on the plus side, text is quite legible for a facsimile: viii, 544p., index. A nice squat little volume in perfect condition. Note that volume III is widely available solo, it must be the most curious one, although there were plates but none here, these appearing in the earlier books. Special edition. 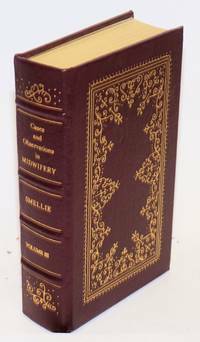 "This special edition has been privatrely printed for the members of The Classics of Obstetrics & Gynecology Library by Quebecor Printing Kingsport. Film was prepared from the first edition of 1764.. New type matter was composed by P&M Glatfelter Company. 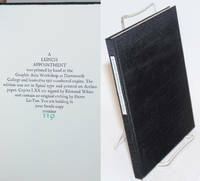 The volume has been bound in genuine leather .. Endleaves are a specially commissioned design of Iris Nevins. Cover stamping and design of the blah blah blah..
Washington DC: Government Printing Office, 1905. A nearly perfect copy of an unnecessarily beautiful book; xxiii, 516p., plus an additions/corrections list and illustrations as called for (see p.vi). 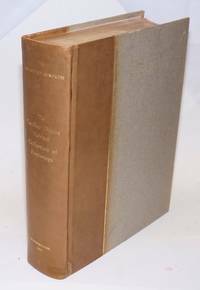 Hardbound, thick 11.5x9 inch grey-papered boards backed by a well-tanned pressed-calf spine with bright gilt titling and ruling. Spongey deckled paperstock throughout with four or five brief entries each page in smallpoint letterpress, a boggling waste of materials. Top edge gilt, very bright and tight. The only flaw is a toning of overlap of leather upon grey paper, causing narrow vertical lines of discoloration and similar tonings to endsheet papers. A gorgeous relic in near-fine condition. Laid in is a single printed announcement over the signature of Herbert Putnam, a Congressional librarian; Mr. Putnam explains that customary "general distribution" of LoC material cannot be observed in this case but that copies are still available at $3.50 each. San Francisco: Kayak, 1967. 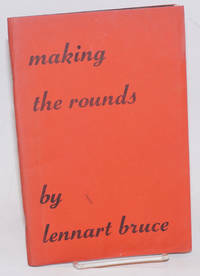 52p., 6.5x9.5 inches, decorations, lightly-worn first edition chapbook designed and printed by George Hitchcock limited to 400 copies in stapled red printed wraps, rusty staples. London: Faber & Gwyer Ltd, 1928. 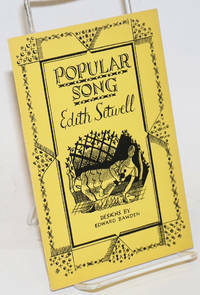 [4p]4.75x7.25 inches, color full-page illustration, two page centerfold of the poem, backlist, very good first edition chapbook in plain sewn wraps and yellow decorative dj. The Ariel Poems #15. n.p. : Tangram, 1990. [14p] 6.25x9.5 inches, fine first limited edition chapbook printed from Monotype Spectrum on Mohawk Superfine in an edition of 200 copies with calligraphy by Thomas Ingmire, this copy inscribed and signed by the poet, fine in sewn blue rag paper wraps with paper title label affixed front cover.